sculpture trophies at the $50,000 FSP Gold River Women's Challenger. Maria Sanchez's background looks like a textbook case of how not to become a professional tennis player. She grew up in sleepy Modesto in Northern California rather than a tennis hotbed such as bustling Los Angeles or Miami. She began playing at 10 -- by accident -- rather than 5 or younger. Her middle-class parents did not play the game. She attended a public high school rather than being home-schooled or shipped off to a tennis academy. And rather than turn pro out of high school, she not only went to college, she stayed for four years and graduated. These days, that's just not how it's done. Sanchez, though, had three things going for her. She was born with great athletic ability, she immediately fell in love with tennis, and she grew to be 5-foot-10 (even though height does not run in her family). Sanchez, 22, has parlayed those gifts into a promising tennis career. 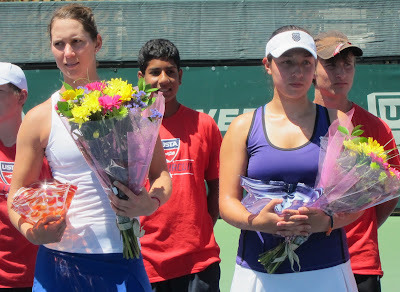 She continued her progress Sunday, beating 18-year-old Jessica Pegula of Boca Raton, Fla., 4-6, 6-3, 6-1 in the $50,000 FSP Gold River Women's Challenger for her first pro singles title. Sanchez, who owns six doubles crowns, fell one step short of a sweep in the inaugural tournament at the Gold River Racquet Club. In the doubles final, second-seeded Asia Muhammed of Henderson, Nev., and Yasmin Schnack of Elk Grove beat unseeded Kaitlyn Christian of Orange and Sanchez 6-3, 7-6 (4). Schnack usually plays doubles with Sanchez but paired with Muhammed because they will be teammates on the Capitals during the World TeamTennis season in July. Sanchez and Christian are former teammates at USC, where Christian will be a junior in the fall. In Sanchez's first full year as a pro, she has soared from No. 687 to No. 287 in the world in singles and from No. 268 to No. 150 in doubles. At this rate, she could play in Grand Slam tournaments -- especially in doubles -- this year or next. Sanchez, who last year was named the Pacific-10 Conference Women's Player of the Year and graduated with a degree in real estate, said she has no regrets about her unconventional path. "My parents are both teachers," Sanchez explained. "Education has always been a priority and to still live a normal life instead of being focused on tennis. I always knew it was important for me and my brothers to get a college degree. I knew I was going to USC to get a degree and improve my tennis. It was great to be around my coaches and teammates there. "I wanted to stay four more years, but unfortunately I had to leave," she added with a smile. Sanchez, the only daughter of Luis and Catherine Sanchez, grew up with four older brothers. "She always said, 'Dad, play basketball with me,' " Luis, a math teacher at Joseph A. Gregori High School in Modesto, said at Gold River. "She didn't want to play with Barbie dolls. She wanted to play sports." Maria was 2 1/2 years old when her parents first noticed that she had extraordinary physical ability. "She rode a two-wheeler without training wheels," said Catherine Sanchez, a first-grade teacher. "Within a week, she was going down the porch steps (on her bicycle)." As a child, Maria excelled at basketball and softball. "We didn't know anything about tennis," Luis said. "It was the furthest thing from our mind. She was on a traveling softball team for 10-year-olds at 7. We thought she was going to be a great softball player." But when Maria was 10, her parents went on a one-year sabbatical and took the family to Guadalajara, Mexico. "My dad has family there," Maria said. "He wanted to give me and my brothers experience in a different culture." But there was no basketball or softball in Guadalajara, so Maria began playing tennis and golf. "I knew once I started tennis, I'd stay with it," she said. "There was a club nearby, and they had a tennis clinic for children. She liked it. She wanted to start taking lessons, but I said, 'I'm not going to throw my money away.' So she started hitting the ball against a wall all the time, and the coaches said, 'Hey, she's got ability,' " Luis said. As Maria showed Sunday, she indeed can do it all on the court. She moves well for her size. She has a big serve, a punishing forehand and a beautiful two-handed backhand. And she has an excellent volley, a rarity in today's game. She also has a temper, receiving a warning for an audible obscenity in the first game of the third set. But the fourth-seeded Sanchez got off to a shaky start in the match, losing her serve four of five times in the opening set against the fifth-seeded Pegula in their first career meeting. "I felt a little nervous," Sanchez admitted, "and she was playing well. I knew I had a lot of misses. I told myself to calm down and trust myself and all the work that I've put in, that it would get better and to be patient." Sanchez, who's tutored part-time by legend Chris Evert at the Evert Tennis Academy in Boca Raton, was stronger physically and mentally in the third set. In Saturday's semifinals, Pegula had survived a long three-setter while Sanchez had breezed. The temperature reached 95 degrees Saturday and 90 Sunday. Sanchez is lean, yet muscular, whereas Pegula is a compact 5-foot-6 much like world No. 8 Marion Bartoli of France. After Pegula slugged a backhand way long for her second straight unforced error to lose her serve and trail 2-0 in the third set, she complained, "I'm so tired, I can't hit the ball." Sanchez's apparently superior physical conditioning also gave her a mental edge. "In the third set, she hung a little tougher than I did in the first few games," said Pegula, whose billionaire father, Terry, owns the NHL's Buffalo Sabres. "She believed in her game a little more than I did. I let it get to me too much, and the next thing I know, I'm down 3-0 (one service break). It's a little tough to come back from that." Fittingly, Sanchez's first pro singles title came close to home. "It's nice to be here playing in front of my home crowd and having friends and family here to support me," said Sanchez, who earned $7,315 for the crown. "That makes it an even more special moment." French Open in Paris -- Second-seeded Bob and Mike Bryan reached the men's doubles quarterfinals of the French Open with a 6-3, 6-2 victory over Mark Knowles, 40, of the Bahamas and Xavier Malisse of Belgium. The 34-year-old Bryan twins, the 1998 NCAA champions from Stanford and 2003 French Open titlists, seek their record 12th Grand Slam title in men's doubles. They will face Oliver Marach of Austria and Horacio Zeballos of Argentina. Knowles, who will return for his 11th season with the Capitals, and Malisse are former French Open men's doubles champions with different partners. Top seeds and defending champions Max Mirnyi and Daniel Nestor dismissed 15th-seeded Americans Scott Lipsky and Rajeev Ram 6-2, 6-4 to gain the quarterfinals. Lipsky reached the 2002 NCAA doubles final with Stanford teammate David Martin. Mike Bryan also reached the mixed doubles quarterfinals. The second-seeded Bryan and Kveta Peschke of the Czech Republic advanced when Bethanie-Mattek Sands of Phoenix and Horia Tecau of Romania retired while trailing 5-2. Men's Futures in Sacramento -- Former top-70 player Chris Guccione of Australia has withdrawn from the $15,000 Tennis Town Pro Tennis at Park Terrace. The top seeds, in order, are Americans Tennys Sandgren (ranked No. 289 in the world), Gregory Ouellette (No. 354) and Michael McClune (No. 452). The final round of qualifying begins at 10 a.m. today at the Park Terrace Swim & Tennis Club. The main draw runs from Tuesday to Sunday. Today -- Fourth round, ESPN2, 2-7 a.m. (live); Tennis Channel, 7 a.m.-4 p.m. (live). French Open Tonight (daily wrapup), Tennis Channel, 4-7 p.m. (premiere), 7-10 p.m. (repeat). Tuesday -- Quarterfinals, Tennis Channel, 5-10 a.m. (live); ESPN2, 10 a.m.-4 p.m. (taped). French Open Tonight (daily wrapup), Tennis Channel, 4-7 p.m. (premiere), 7-10 p.m. (repeat). Wednesday -- Quarterfinals, ESPN2, 5-10 a.m. (live); Tennis Channel, 10 a.m.-4 p.m. (taped). French Open Tonight (daily wrapup), Tennis Channel, 4-7 p.m. (premiere), 7-10 p.m. (repeat). Thursday --Women's semifinals, ESPN2, 5-10 a.m. (live); Tennis Channel, 10 a.m.-4 p.m. (repeat). French Open Tonight (daily wrapup), Tennis Channel, 4-7 p.m. (premiere), 7-10 p.m. (repeat). Friday -- Men's semifinals, Tennis Channel, 4-8 a.m. (live); NBC, 11 a.m.-5 p.m. (taped), Tennis Channel, 2-9 p.m. (repeat). Saturday -- Women's final, NBC, 6-9 a.m. (live). Sunday -- Men's final, NBC, 6-11 a.m. (live); Tennis Channel, 11 a.m.-3 p.m. (repeat), 5-9 p.m. (repeat). Women's final, Tennis Channel, 3-5 p.m. (repeat). THROUGH SUNDAY -- FRENCH OPEN, www.rolandgarros.com. Today -- $15,000 Tennis Town Pro Tennis at Park Terrace, Park Terrace Swim & Tennis Club, 5500 Parkfield Court, Sacramento, final-round qualifying, 10 a.m. Main draw Tuesday through Sunday. www.parkterraceprotennis.org. Saturday-Sunday, June 16-18 -- NorCal 18 Junior Sectional Championships, Sacramento State, www.norcal.usta.com. Saturday-June 17 -- $15,000 Chico Futures, Chico Racquet Club & Resort, 1629 Manzanita Ave.
no 1 seeing your own videos? You require to learn how to get your video before people, or there's absolutely absolutely no purpose to investing time to making a video. and receive views to your video for free. Film Craze is an independent film maker's best friend!